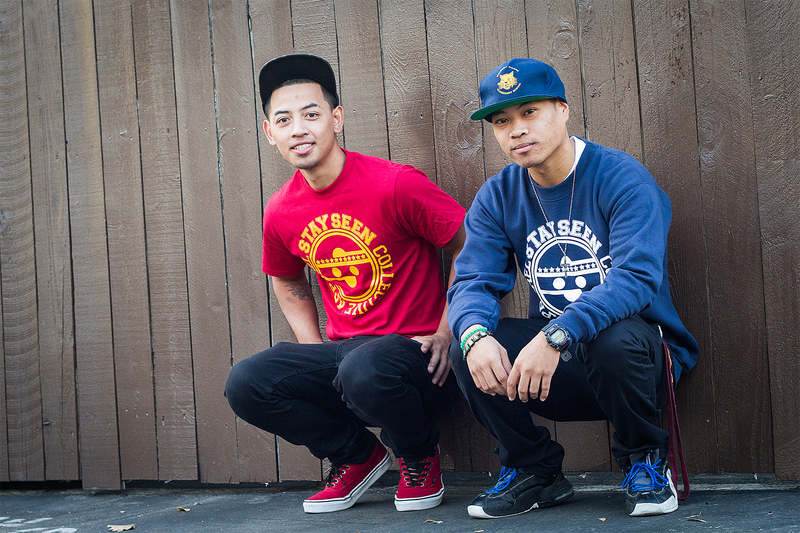 Johnny Sam, 23, and Daniel Ocampo, 22, created the apparel company Stayseen Collective just a couple of months ago. Photo by Guinevere Yep. For many students, attending a community college isn’t just about completing coursework and earning a degree. It’s also about exploring one’s passion and establishing business relationships that can last a lifetime. City College sophomores Daniel Ocampo, sociology major, and Johnny Sam, flight technology major, met in English Writing 100 this semester and have since turned their friendship into a business venture, a clothing line called Stayseen Collective, that they hope will become a local phenomenon. Ocampo says it took about four years to find someone who was serious about starting a business with him. He explains that the idea for the name came to him shortly after he graduated high school while he was considering the creation of a YouTube channel with some friends. Later, Stayseen Collective became the name of the clothing line. “I just want to be visual,” said Ocampo. But Ocampo says the people he originally worked with weren’t willing to commit to the venture as much as he would have liked, and it wasn’t until he met his friend and business partner, Sam, that the idea took off. Now, the duo says they hope to turn their business into an outlet for helping local hip-hop artists promote their music. Ocampo and Sam began printing and selling T-shirts and crewnecks, which range in price from $18 to $28, approximately two months ago, and the initial printing of about 24 shirts sold out in approximately 48 hours. According to Sam, who is in charge of marketing and advertising the brand, the next step for Stayseen is to promote their products at local events. Ocampo’s vision for the clothing line is a little different. “I wouldn’t mind walking through any type of mall and seeing our brand out there, but for me it’s more like I want to be able to express the true passion for graphic design,” Ocampo says. Ocampo explained that some brands’ logos are too complicated or don’t necessarily convey a message, and that his goal is to keep their designs simple while still putting across a positive message. Ocampo explains that the logo started out as a basic design using circles, which was inspired by a panda tattoo that Sam has on his right arm. Since Ocampo came up with the name of the clothing line, he wanted to integrate something from Sam into the logo. He says he noticed that Sam is always wearing a type of hat called a snap back, which is a traditional baseball cap that has a snapping mechanism on the back of the hat. Ocampo took the idea of the snap back and added a line of stars to the logo to symbolize the snaps on the hat. The final logo resembles a smiling face, using the original circles idea, wearing a backward snap back cap, surrounded by the words ‘Stayseen Collective’. Still, Sam says even if the business takes off, he still plans to work in his field. For Ocampo, it remains a sort of a wait-and-see situation. Sam added that he and Ocampo contacted the Express after a suggestion from Olsen. Ocampo says success comes down to being positive, dedicated and passionate, but that getting noticed takes time. For more information on Stayseen Collective or to purchase T-shirts and sweatshirts, visit www.stayseencollective.bigcartel.com or instagram.com/stayseencollective. This entry was posted in Features, Sac City Express (SCC) and tagged clothing, Daniel Ocampo, Instagram, Johnny Sam, Ocampo, Seen, shirts, Stay, Stayseen Collective. Bookmark the permalink.